This is a list of common words in civil aviation and air travel terminology. Definitions were assembled from many sources, including the online version of Pilot Magazine, compiled by James Allan, Mike Jerram and Tony French. AAIB: Air Accident Investigation Branch of the Department of Transportation of the United Kingdom. Its role is to investigate air accidents. The letters AAIB also refer to equivalent organizations in Iceland, Singapore and Switzerland, among others. In the United States, the NTSB plays that role. AB: Air Base. More often used when describing a military airport. 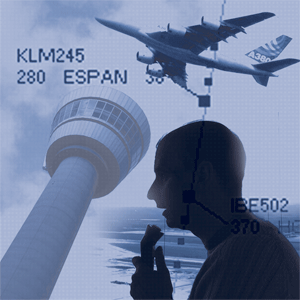 ACARS: Aircraft Communication Addressing and Reporting System. Type of radio or satellite communications system aboard an aircraft. ADELT: Automatically Deployable Emergency Locator Transmitter. See ELT. ADF: Automatic Direction Finder. Radio compass giving a relative bearing to a NDB. ADI: Attitude Deviation Indicator. Enhanced artificial horizon with pitch and roll information. It is part of a flight director system. Aerodrome: Any location from which aircraft operations take place (airports, military air bases, etc.). AFCS: Automatic Flight Control System. It is an advanced autopilot. AIRMET: Aircraft’s Meteorological Information. A type of weather advisory regarding certain weather conditions (turbulence, icing, low visiblity) which could pose a threat to only smaller types of aircraft. SIGMET is a more inclusive type of advisory. Alternate: Airport indicated on a flight plan where it is possible to divert the aircraft from its scheduled destination (in case of bad weather or any other major situation). Altimeter setting: barometric pressure reading in millibars (for example: 1015), or inches of mercury (for example: 29.80) used to set a pressure altimeter’s sub-scale to QFE or QNH. APU: Auxiliary Power Unit. Device (usually a small turbine) that provides power for engine-starting and other systems while on the ground. Such device is present on large aircraft and some business jets, and replaces the GPU. ATIS: Automatic Terminal Information Service. Automatically recorded message transmitted on a particular frequency, containing current weather conditions, QNH setting, active runways, etc., provided at the major airports. AVGAS: Aviation Gasoline. Usually followed by the octane rating. Used by piston-engined aircraft. AVTUR: Aviation Turbine fuel (kerosene). Used by turboprops and jet aircraft. Base: Base of operations or a hub for an airline. The base leg is also one of the many words describing the approach segments. See Final for a diagram. Bleed air: Hot compressed air taken from turbine engines. Black Box: Popular name given to either the CVR or the FDR used to investigate an accident. BRG: Bearing. Horizontal direction to/from a point, expressed in degrees (for example: 000 or 360 is North, 090 is East). CAA: Civil Aviation Authority. An organization in charge of defining aviation safety standards. The United Kingdom and New Zealand, among others, have organizations with that exact name and role. In the United States, CAA stood for the Civil Aeronautics Administration, a fore-runner of today’s FAA. CAB: Civil Aeronautics Board. Former government agency of the United States responsible, among other things, of investigating air accidents (duties taken over by the NTSB) and controlling which routes the airlines could fly and what fares they could charge (prior to the Airline Deregulation Act). Callsign: Phrase used in radio transmissions to identify an aircraft, before proceeding to actual instructions. A callsign for a commercial aircraft may be “Swissair 111” or “TWA 800”. As for a private plane, it could be something like “Cessna 13 Whisky”, “Baron 232 Zulu” or “November 17 Victor”. Military callsigns, including transport of heads of state or government officials are more diverse and depend on squadron, type of mission, etc. CAS: Calibrated Airspeed. IAS corrected for air density and compressibility. CDI: Course Deviation Indicator. The vertical needle of a VOR indicator which shows the aircraft’s position relative to the selected radial. Ceiling: Height above ground or water level of the base of the lowest layer of cloud, below 20,000 feet, covering more than half of the sky. Service ceiling also means an aircraft’s density altitude at which its maximum rate of climb is lower or equal to 100 feet per minute. The absolute celing is the highest altitude at which the aircraft can maintain level flight. Coast track: Status of an aircraft that is no longer giving a radar return. The air traffic control screen will display this status (usually with the acronym “CST”) and will temporarily continue displaying the aircraft’s movement at the last heading and speed, as if it was “coasting”. COMAT: Company Material. Non-revenue cargo, such as aircraft spare parts. Connection: Transfer between two different flights at an intermediate airport (for example: flight 123 from New York to Miami followed by flight 456 from Miami to Sao Paulo). If a passenger’s flights are operated by two different airlines, they may check baggage or obtain boarding passes for the entire itinerary directly at the departure city’s airport, pursuant to interlining agreements or airline alliances. A connection is not the same as a stopover. Crosswind: Wind perpendicular to the motion of the aircraft. The crosswind leg is also one of the many words describing the approach segments. See Final for a diagram. CRT: Cathode Ray Tube. Television-like screens used in flight decks of new-generation aircraft, replacing the conventional instruments. See also EFIS. CST: See Coast track. CST may also stand for Central Standard Time. CVR: Cockpit Voice Recorder. One of the so-called “black boxes”. It is a device recording the last 30 minutes of sound inside the cockpit, before impact. Sounds recorded include all conversations, radio transmissions, and background noise. Density altitude: pressure altitude (as indicated by the altimeter) corrected for air temperature. DH: Decision Height. Height on a precision approach at which the pilot must have the runway approach lights in sight to continue descent, or if not, initiate a go-around. DI: Direction Indicator. A gyro instrument which indicates the magnetic heading of an aircraft. The DI, also known as the directional gyro (DG), is free of the turning errors associated with magnetic compasses but is prone to precession (wander) and must be reset against the magnetic compass at intervals. Direct flight: A flight that operates from point A to point B without a connection. A direct flight is not necessarily non-stop. DME: Distance-Measuring Equipment. A combination of ground and airborne equipment which gives a continuous slant range distance-from-station readout by measuring time-lapse of a signal transmitted by the aircraft to the station and responded back. DMEs can also provide groundspeed and time-to-station readouts by differentiation. Downwind: One of the many words describing the approach segments. See Final for a diagram. EFIS: Electronic Flight Instrument System, in which multi-function CRT displays replace traditional instruments for providing flight, navigation and aircraft systems information, forming a so-called “glass cockpit”. EGT: Exhaust Gas Temperature. One of the flight deck’s engine gauges. EICAS: Engine Indication and Crew Alerting System. A CRT display indicating engine performance and alerts. ELB: Emergency Locator Beacon. See ELT (below). ELT: Emergency Locator Transmitter. Small radio transmitter fixed on the aircraft’s structure, automatically activated by impact or water immersion, transmitting a code enabling SAR satellites or search units equipped with Direction Finders to locate the aircraft’s crash site. Also called ADELT or ELB. ETOPS: Extended-range Twin Operations. Certification given to two-engine aircraft for long overwater flights. Popular deformation of this term is “Engines Turning Or Passengers Swimming”! F/A: Flight Attendant. Also known as Air Hostess in the UK, formerly known as Steward(ess) in North America. FAA: Federal Aviation Administration. A national aviation authority in charge of defining aviation safety standards in the United States. In some countries, such as the United Kingdom, an equivalent organization is called the CAA. FBO: Fixed-Base Operator. Supplier of fuel, maintenance, aircraft rental or sale, flight training, etc, at the airport. FBW: Fly-By-Wire. Aircraft controls where the pilot’s commands (bank, yaw…) are transmitted to control surfaces electronically or via fiber optics, instead of mechanical linkage. Also called FBL (Fly-By-Light). FDR: Flight Data Recorder. One of the so-called “black boxes”. It is actually painted bright orange to be easily identified among aircraft debris, and records various parameters such as altitude, heading, airspeed, engine statistics, etc… It is used to investigate in the case of an accident. F/E: Flight Engineer. Also known as Second Officer. FIDS: Flight Information Display System. Real-time flight arrival and departure data for an airport, either as a board inside or near the airport terminal or a virtual version on a website or teletext. Fin number: See FN below. Final: Final Approach. One of the many words describing the approach segments. The part of a landing sequence or aerodrome circuit procedure in which the aircraft has made its final turn and is inbound to the active runway. See picture on the right. FL: Flight Level. Altitude at barometric setting of 1013.2 millibars or 29.92 inches of mercury, expressed in rounds hundreds of feet. This is usual mostly above 18,000 feet. FL350 is 35,000 feet. F/O: First Officer. Also known as Co-Pilot. FN: Fleet Number. Internal number, for the use of the airline, identifying a particular aircraft within the fleet. FPM: Feet Per Minute. Unit of measure of an aircraft’s rate of climb or descent. Go-Around: Balked approach, when the aircraft climbs away from the runway during the approach, to either start the approach again, or proceed to the alternate airport. GPS: Global Positioning System (Navstar). Navigational system using orbiting satellites to determine the aircraft’s position on the Earth. Developed at first for military use, then widespread on commercial and private aircraft, it is now expected to replace the ground-based navigational systems for its accuracy and reliability. GPWS: Ground Proximity Warning System. A radar-based flight deck system to give pilots audible warning by means of horns, hooters, taped or synthetic voices of terrain close beneath an aircraft’s flight path. One of the GPWS’ warnings might be: “TERRAIN! WHOOP WHOOP! PULL UP!” or “WINDSHEAR! WINDSHEAR!”. Ground speed: Actual speed of an airplane as measured relative to the ground. GS: Glideslope. Vertical guidance, part of an ILS, establishing the safe glidepath to a runway. A standard ILS glideslope is 3 degrees. HDG: Heading. The direction in which an aircraft’s nose points in flight in the horizontal plane, expressed in compass degrees (for example: 000 or 360 is North, 090 is East). Heavy: Suffix used in radio transmission callsigns (for example: “United 492 Heavy”) to indicate the aircraft is capable of generating wake turbulence. Holding pattern: Manoeuver consisting of making the aircraft turn around the aerodrome at an assigned altitude, while awaiting further ATC instructions. HSI: Horizontal Situation Indicator. A cockpit navigation display, usually part of a flight-director system, which combines navigation and heading. Hub-and-spoke: Route system in which an airline will fly the majority of its flights from/to the same city (the hub), thus offering several connecting possibilities, as opposed to fly a series of point-to-point flights. Example: instead of flying non-stop from Los Angeles to New York, from Phoenix to Washington, from Las Vegas to Boston, etc., an airline will offer all these routes via its hub in Chicago. IAS: Indicated Airspeed. Airspeed indicated by the Airspeed Indicator, without correction for position error, altitude, or outside air temperature. Ident: Squawk function of a transponder. When the “Ident” button is activated, an aircraft will briefly appear more distinctly on a radar scope. Used for identification or acknowledgement purposes. IFR: Instrument Flight Rules prescribed for the operation of aircraft in instrument meteorological conditions. ILS: Instrument Landing System. Consists of the localizer, the glideslope and marker radio beacons (Outer, Middle, Inner). It provides horizontal and vertical guidance for the approach. INS: Inertial Navigation System. It uses gyroscopes and other electronic tracking systems to detect acceleration and deceleration, and computes an aircraft’s position in latitude and longitude. Its accuracy, however, declines on long flights. Also called IRS, or Inertial Reference System. Knot (kt): Standard unit of speed in aviation and marine transportation, equivalent to one nautical mile per hour. One knot equals 1.1515 mph, and one nautical mile equals 6,080 feet. The word “knot” replaces “nautical miles per hour”, and one should never say for example “60 knots per hour”. LATCC: London Area and Terminal Control Centre at West Drayton, near London’s Heathrow Airport. LN: Line Number. Priority of the aircraft in the manufacturer‘s line. A Boeing 757-200 with a LN of 275 was the 275th plane of its type to be built. LOC: Localizer. The azimuth guidance portion of an instrument landing system. LORAN: Long-Range low-frequency Radio Navigation. Its range is about 1,200 nm by day, and 2,300 nm by night. LROPS: Long Range Operational Performance Standards. Certification intended to replace ETOPS as it would include all types of aircraft (not just twin-engine). Magnetic course: Intended horizontal direction, measured in degrees clockwise from the magnetic north. Mach number: Ratio of true airspeed to the speed of sound. Mach 1 is the speed of sound at sea level. Its value is approximately 760 mph. Manufacturer: Aircraft builder, such as Airbus, Boeing, Embraer, etc. Mayday: The ultimate international radio distress call, indicating imminent danger to the life of the occupants onboard and requiring immediate assistance. Its slightly less prioritary equivalent is Pan Pan. The anecdote says it comes from a French pilot who said over the radio “Venez m’aider” (“help me”) to an English-speaking controller, who only understood “Mayday”. METAR: Aviation routine weather report. Format for shorthand weather information reporting using a standardized set of codes and abbreviations (for example: BKN broken clouds, OVC overcast, CAVOK ceiling and visibility okay, etc.) Acronym possibly comes from the French “Météorologie Aviation Régulière” (routine aviation weather). MLS: Microwave Landing System. A microwave-based instrument approach system intended to replace ILS in the 1990s and claimed to offer a number of advantages such as the ability to fly segmented and curved precision approaches. MSN: Manufacturer Serial Number. Internal number, for the use of the manufacturer, identifying a particular aircraft within the same model. NDB: Non-Directional Beacon. A medium-frequency navigational aid which transmits non-directional signals, superimposed with a Morse code identifier and received by an aircraft’s ADF. Non-Revenue: Passenger flying free of charge, on a standby basis, by presenting an airline/aviation employee pass. Non-Revenue passengers may or may not be on duty, therefore this expression also applies to repositioning crew members. Also known as Non-Rev for short. Non-stop: A direct flight that operates from point A to point B without a stopover. NORDO: No radio. Aircraft without a radio or experiencing a radio failure. No-Show: Passenger with a confirmed reservation, who failed to check-in or board on time. NOTAM: Notices To Airmen. Issued by the country’s aviation authority to inform pilots of new or changed aeronautical facilities, services, procedures, or hazards, temporary or permanent. NTSB: National Transportation Safety Board. A United States government organisation in charge of investigating in the case of an accident. In many countries, an AAIB fulfills that role. Pan Pan: International radio urgency call. It usually indicates a threat to the safety of an aircraft or its passengers. It is, however, less urgent than Mayday. Pan Pan comes from the French word “Panne” which means “failure”. Phonetic alphabet: Spelling technique under which each letter is replaced by a word starting with the letter in question (for example: “Alfa, Bravo, Charlie” to spell “ABC”). The current alphabet is also known as the ICAO spelling alphabet, the international radiotelephony spelling alphabet or the NATO phonetic alphabet. PNR: Passenger Name Record. Another word for Reservation. POB: Number of Persons On Board. Also SOB, Souls On Board. POH: Pilot’s Operating Handbook. It is the aircraft’s “owner’s manual”. psi: Pounds per Square Inch. Unit of measure for pressure. QDR: magnetic bearing from the station. QFE: atmospheric pressure at aerodrome elevation. With its sub-scale set to the aerodrome QFE an altimeter will indicate height above that airfield. QFU: magnetic orientation of runway in use. QNE: reading in feet on an altimeter set to 1013.2 millibars (standard pressure) when the aircraft is at aerodrome elevation. QNH: altitude above mean sea level based on local station pressure. QTE: true line of position from a direction-finding station. Radial: line from a VOR or NDB. For example, the 180 radial from a VOR represents a line south of that VOR. RAS: Rectified Airspeed. IAS corrected for instrument position error. Repositioning: Flying from the point of destination to the next point of origin, without carrying any payload (in the case of an aircraft) or without being responsible for payload (in the case of a crew member). Example: a scheduled U.S. airline operates a charter flight from Los Angeles to Lisbon. Then, payload-free, it flies to Paris, where it will board passengers and cargo for a scheduled flight back to Los Angeles. Also known as deadheading, ferry flight. RMI: Radio Magnetic Indicator. A navigation aid which combines DI, VOR and/or ADF display and will indicate bearings to stations, together with aircraft heading. RNAV: Area Navigation. A system of radio navigation which permits direct point-to-point off-airways navigation by means of an on-board computer creating phantom VOR/DME transmitters termed waypoints. Roger: Commonly used word in aviation communications, to indicate that an instruction has been received and understood. Also, to roger is to read back and acknowledge an instrction. The origin of this word is the former RAF phonetic alphabet in which the letter R (for “received”) was for Roger, as opposed to Romeo today. RON: Remain Overnight. Aircraft remaining overnight at the airport, either at the gate, remote parking stand or hangar. Airlines take advantage of RONs to perform maintenance, cleaning, etc. on the aircraft. RVR: Runway Visual Range. A horizontal measurement of visibility along a runway. SELCAL: Selective Calling. A high-frequency system enabling air traffic control to alert a particular aircraft, by means of flashing light or aural signal in the cockpit, for receipt of a message without the crew having to maintain a listening watch. Used on long-haul over-ocean airline routes and by intercontinental business jets. Shanwick: ATC located in Shannon (Ireland) and Prestwick (Scotland, UK), hence the name. Shanwick looks after traffic in the Northern Atlantic coast of Europe. SID: Standard Instrument Departure. A standard IFR departure route enabling air traffic controllers to issue abbreviated clearances and thus speed the flow of traffic. SIGMET: Significant Meteorological Information. A type of weather advisory regarding severe weather conditions (thunderstorms, turbulence, icing, volcanic ash, etc.) which could pose a threat to all types of aircraft. AIRMET is a less inclusive type of advisory. SOB: Souls (persons) On Board. Also POB, Persons on Board. SOCAL: Southern California TRACON, the busiest approach control in the world, located in San Diego. Controls most arrivals for commercial, general aviation, or military airfields in Southern California. Also known as SCT for short. 7600: Loss of radio (NORDO). Pilot tunes 7700 for 1 minute, then 7600 for 15 seconds. SSR: Secondary Surveillance Radar. A radar system comprising a ground-based transmitter/receiver which interrogates a compatible unit in the aircraft (the transponder), providing instant radar identification without having to manoeuvre. Assigned four-digit transponder codes are referred to as squawk (see above) codes. Standby: In radio communications, is a word to ask the other person to wait for further instructions. A standby reservation is conditional and is on a waiting list, in case of any no-shows. STAR: Standard Terminal Arrival Route, for inbound IFR traffic. STOL: Short Take-Off and Landing. Stopover: Scheduled interruption of a flight at an intermediate airport, either to refuel (in which case, it is known as a “technical stopover”) or to pick up/drop off payload (for example: flight 789 from New York to Delhi, with a stopover in London). Unlike a connection, a stopover usually does not involve a change of flight number or airline, but may involve a change of aircraft. STOVL: Short Take-Off and Vertical Landing. TACAN: Tactical Air Navigation system. An ultra-high frequency electronic navigation aid which provides suitably-equipped aircraft with a continuous indication of bearing and distance to the selected Tacan station. The distance element can be received by civilian DME equipment, but otherwise Tacan is principally a military navaid. TAS: True Airspeed. Rectified airspeed corrected for altitude and outside air temperature. TCAS: Traffic alert and Collision Avoidance System. U.S. developed radar-based airborne collision avoidance system operating independently of ground-based equipment. TCAS-I generates traffic advisories only, TCAS-II provides advisories and collision avoidance instructions in the vertical plane. Tailwind: Strong wind in the same direction as the motion of the aircraft. TOGA: Take-off/Go Around. An autopilot setting activating take-off or go-around thrust. Touchdown: Synonym of landing. May also refer to a stopover that does not involve a change of aircraft or flight. TRACON: Terminal Radar Approach Control. ATC for departures and approaches. Transition altitude (TA): Altitude in the vicinity of an aerodrome at or below which the vertical position of an aircraft is controlled by reference to altitude (with the aerodrome QNH set on its altimeter). Above transition altitude QNE is set and flight levels used. Also called transition level (TL) at which a descending aircraft changes from FL to QNH. Transponder: Airborne receiver/transmitter portion of the SSR system which receives the interrogation signal from the ground and automatically replies according to mode and code selected. Modes A and B are used for identification, using a four-digit number allocated by air traffic control. Mode C gives automatic altitude readout from an encoding altimeter. TSB: Transportation Safety Board of Canada. Agency that investigates accidents, in a similar fashion to the NTSB in the United States or an AAIB in other countries. UHF: Ultra-High Frequency. Radio frequencies in the 300-3,000 MHz band. UM: Unaccompanied Minor. Underage passenger (typically 5-15 years old) travelling without a parent, guardian or trusted adult. An UM is under the constant supervision of airline staff from the departure gate until he or she is picked up at the arrival airport. UNICOM: privately-operated advisory air-to-ground radio service at uncontrolled airfields, in the United States. Upwind: One of the many words describing the approach segments. See Final for a diagram. V1: decision speed, up to which it should be possible to abort a take-off and stop safely within the remaining runway length. After reaching V1 the take-off must be continued. VA: design manoeuvring speed. The speed below which abrupt and extreme control movements are possible (though not advised) without exceeding the airframe’s limiting load factors. VFE: maximum flap extension speed (top of white arc on ASI). VMCA: minimum control speed (air). The minimum speed at which control of a twin-engined aircraft can be maintained after failure of one engine. VMO: maximum operating speed. Also Mmo, Mach limit maximum operating speed. VNE: never-exceed speed, ‘redline speed’ denoted by a red radial on an ASI. VNO: normal operating speed. The maximum structural cruising speed allowable for normal operating conditions (top of green arc on ASI). VR: rotation speed, at which to raise the nose for take-off. VSO: stalling speed at MTWA, in landing configuration with flaps and landing gear down, at sea level, ISA conditions (bottom of white arc on ASI). VX: best angle of climb speed on all engines. VXSE: best engine-out angle of climb speed. VY: best rate of climb speed on all engines. VASIS: Visual Approach Slope Indicator System. A colored light system providing visual guidance to the glidepath of a runway. VFR: Visual Flight Rules. Prescribed for the operation of aircraft in visual meteorological conditions (VMC). VMC is generally defined as 5 miles visibility or more and 1,000 feet vertical and one nautical mile horizontal clearance from cloud, but variations apply to aircraft operating below 3,000 feet AMSL. Special VFR (SVFR) clearances are granted at the discretion of ATC for VFR flight through some controlled airspace where IFR usually apply. VHF: Very High Frequency. Radio frequencies in the 30-300 MHz band, used for most civil air-to-ground communication. VOR: Very high frequency Omnidirectional Range. A radio navigation aid operating in the 108-118 MHz band. A VOR ground station transmits a two-phase directional signal through 360°. the aircraft’s VOR receiver enables a pilot to identify his radial or bearing from/to the ground station. VOR is the most commonly used radio navigation aid in private flying. Increased accuracy is available in DVOR which have replaced some VORs in the UK system. Also VORTAC, combined VOR and TACAN, and VOT (VOR test facility). VSI: Vertical Speed Indicator. One of the primary flight instruments showing rate of climb or descent. V/STOL: Vertical and Short Take-Off and Landing. VTOL: Vertical Take-Off and Landing. Wake turbulence: Wingtip vortices generated behind a wing producing lift. Behind a large heavy aircraft they can be powerful enough to roll or even break up a smaller aircraft. Waypoint: Reference point used for navigation, usually indicated by latitude and longitude and sometimes altitude and typically used for GPS and INS navigation. Willco: Will comply. See Roger. Windshear: localised change in wind speed and/or direction over a short distance, resulting in a tearing or shearing effect, usually at low altitude, that can cause a sudden loss of airspeed with occasionally disastrous results if encountered when taking-off or landing. @Kelisha: Sorry for the late reply. I’ll need more context: where exactly did you see SDD? I always understood that deadheading was used for crew and repositioning was used for aircraft. Haha I reference this all the time even 5 years later. What is the transition level (FL ) or transition altitude of NYC ? @Pinky girl: It’s 18,000 feet in the United States. What does Qtr 7 mean? and 777 – love! 24U mean? what would the term 1500 squawk mean?? @Jack: If you are asking if you can print the glossary and the phonetic alphabet (in Wikipedia), the answer is yes.